A friend very kindly sent me some Malmaison by Floris so that I could wrap up last week's posts on carnation (see Lorenzo Villoresi Garofano, Etro Dianthus, Caron Bellodgia). I had not smelled it in several years, and was surprised to find how closely it matched my memory — it is lovely stuff. Malmaison was originally released by Floris in the first half of the 19th century; it was reformulated and relaunched in 2000. I do not know the notes, but it is reportedly based on the "rare Malmaison carnation", and it is closer to the modern conception of a soliflore than any of the other carnation scents I've discussed so far. The top notes are, quite literally, a burst of fall spices (clove, cinnamon), and the carnation itself takes a few minutes to warm on the skin before it blossoms. It is almost certainly blended with other light floral notes, and there is a just the slightest tinge of green that cuts the sweetness of the flowers. The base is a pale woody musk. Malmaison is less assertive than the Garofano, and brighter, less old-fashioned than the Bellodgia. It is creamier and spicier than either, and while all three are powdery to one degree or another, Malmaison has a kind of cushiony-plush finish that gives it something of a pin-up girl air. 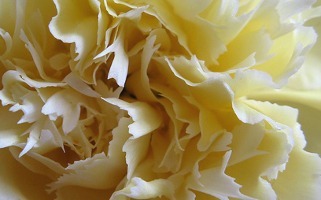 It isn't "me", not by a long shot, but it is a really pretty fragrance, and a must-try for carnation lovers. I would swear it used to come in different bottle: does anyone remember? Somehow, this one doesn't match the scent. 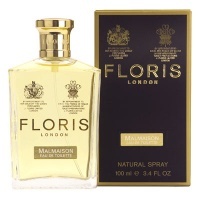 Floris Malmaison is available in 100 ml Eau de Toilette, and can be purchased directly from florislondon. Note: top image is White carnation [cropped] by play4smee at flickr; some rights reserved. Update: Malmaison is now discontinued, reportedly because of new IFRA regulations regarding clove oil. Another update: Floris launched Malmaison Encore in 2013. This is a truly beautiful scent, but, it's not one of the carnation scents I find myself reaching for. It's one of those scents I can appreciate as being absolutely lovely, but can't form an emotional bond with. I think I like my carnations to have more, as Marina would say, oomphaliciousness. The bottle used to be the same shape, but had just a very simple, rectangular dusky pink label. As I've already said, I don't reach for any carnation scents on any regular basis. Garofano doesn't entirely seem like “me” either, but I guess it is more so than Malmaison. Still, I think this is one of the prettiest around. It ought to have a more frou-frou bottle though! I fell in love with Malmaison when I sampled it and got a decant, which I've never touched for some reason: it seems a totally wintery scent to me, something to fluff into. Pin-up is the right word, but… the reason for the no-frills flacon is that this is marketed by Floris as a men's scent, with an Oscar Wilde reference (he wore Malmaison carnations dyed Irish green). It used to have a women's edition too, but there you go! Wintery it is! I do trot out my bottle when it's cold. And Elle's right — simple, rectangular pink label. I've seen some Floris over here, looking for Summer Limes but no joy yet. Maybe in London. PS Yes, I SHOULD be out looking at sights, but it's raining and my feet are tired. Off this afternoon to Wales. I miss you. Agree it isn't a hot weather scent by any means. Still think it needs a different bottle! And an EdP, too. March, I so envy you, have always wanted to see Wales!! Hope it is as lovely as I picture it in my mind. And I miss you too! It is too bad the “payola” thing broke when you weren't here to write something witty about it. They changed the shoulders on the bottle to update it. Not a pin-up girl, you say ? HAH ! don't believe that for one minute. I just bought a decant of Malmaison about a month ago – not instant love but its spiciness is growing on me (I think it reminded me too much of CdG Carnation) and I feel so…British.. when I wear it. One of these days I'll wear it out in the South Florida heat, to see how it performs in a less formal atmosphere. Maybe at the gym? So you think it lacks sufficient staying power so an EDP should be brough out? The staying power is excellent for an EdT, but a deeper version would be nice. Although doubt it sells enough to justify 2 forms. I rarely see it even at the few places near me that carry the Floris line.